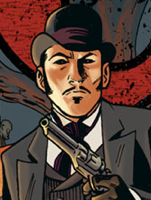 If you haven’t read The Sixth Gun, by Cullen Bunn and Brian Hurtt, you may think it’s just a Western. Well, it’s a 19th-century western U.S. setting, but the crux of the story is less “High Noon” and more “Hellblazer”. Tim is joined by Eugenia to discuss this ongoing Oni Press series. We also take note of Brian Hurtt’s source of photo reference, Shorpy.com. We’ll also hear about what Eugenia‘s doing lately, and this weekend’s Comicdom Con! Our guest this week is Cullen Bunn, writer of ‘The SIxth Gun’ from Oni Press. He has also written ‘The Damned’ and ‘The Damned: Prodigal Sons’ in 2007 & 2008, both from Oni and he is currently writing ‘Fear Itself: The Deep’ for Marvel comics where he has just signed an exclusive contract. He joins us to chat about all this plus; Sasquatch Wrangling, and serving his country as an Alien Autopsy Specialist. If you have a question for Cullen post it on our Facebook wall or give us a call in studio at 506-453-4949. Also; New COmics Day at Strange Adventures and Opening Night at Empire Theatres.